Knowledge Base: How? Why? What? Subscribe to have reminders and discounts delivered to your email inbox. This filter set includes four (4) replacement filters for the Quick Change (Pro-Q) 50 GPD Reverse Osmosis System (PROQ5-50). Stage 1: 5-micron Sediment Filter, QSF-25003. It has high chemical resistance;it removes dirt, sand and rust. In fact, it removes any suspended matter (>5 micron) from water, thus protecting the other filters. This filter is disposable. Stage 2: Granular Activated Carbon (GAC) Filter, QGA-25002. 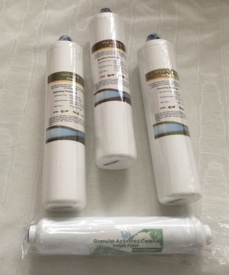 GAC filter removes chlorine and organic chemicals. Stage 3: 10-micron Carbon Block Filter, QCB-25001. This carbon filter takes out residual chlorine and organic chemicals before water goes into the RO membrane/filter. Stage 4: Membrane is Not included in the kit. To get the 5-filter kit instead, click here. Stage 5: Inline GAC filter. All filters are changed once a year.